Português prejudica, silkscreen on cardboard. Yonamine, 2008. The work presented by Yonamine in this exhibition speaks about the idea of erasure. Yonamine comes from an erased country, Angola. A country which history, instead of working as a palimpsest – that is, a text over which multiple writings were produced leaving notice of those preceding them – has always worked as an erasing process. History has been erased in the name of a bigger interest. The Portuguese colonial past that Yonamine evokes with a subtle irony in the exhibition’s title and in the tobacco boxes series was removed by the sudden decolonization process, which, by its turn, was erased by the war that now is being erased by peace. This consecutive cleaning process was an abrasive one, as if the body (of the country) was being wiped out with a steel brush. And the skin, constantly wounded, mutated into a hard, scaly skin, into a carapace. This exhibition represents then an anthology of the erasure, not only through the artistic methods and techniques but also by the proposed concepts. 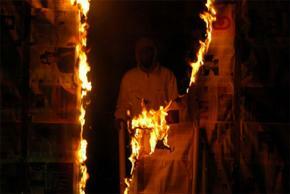 One of the videos of the exhibition is precisely a hand with a black rubber glove relentlessly wiping a glass surface and a wall made of newspapers on fire, opening a hole through which we can see the artist, almost as if a ghost. The newspapers also appear in the gallery floor, as a permanent allusion to the precarious condition of History and Time. Newspapers give notice of the present time, they are the place for the news, but also a place of the ephemeral, of a time that is consumed by the voracity of time itself. To this idea of erasure we can relate an idea of accumulation which is, afterwards, the double face of the same coin. Accumulation is also a way of erasing, as it deals with the logic of over layering and disappearance of the previous layer. This is what happens in “Phreestyle”, a wall-picture that could be an outdoor, built by over layering erased and cut papers plus other elements. 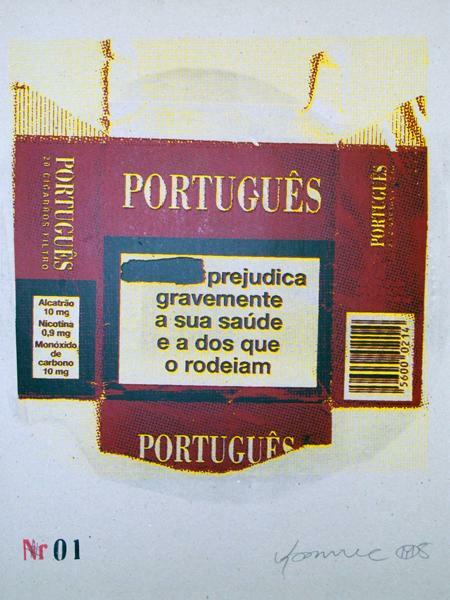 The same can be seen in the serigraphy-graffiti process in the opposite wall of the gallery, where the erased images (almost as a censured text) of the Português Suave tobacco boxes are set directly upon the wall. Or even in the “Wash” series, in which the rough image of George Washington appears tutoring several other iconographic elements, as if the history of the USA is crossed by a “Universal History of Washing”. Yonamine belongs to a movement that is engaged in an iconographic recovery, in a survey of the “state of things” in Angola, headed by the Luanda Triennial curated by Fernando Alvim. It is curious then to realise that the most pertinent drift of this survey ends in a scatology of the ephemeral. And this scatology is, at the same time, ontology: because trash, waste, paper and erasure are arranging elements of this plot. Wash, double video projection. Yonamine, 2008. Then, it is still very relevant that one of the most astonishing works presented is precisely a video work showing a crowd of immaculate white worms eagerly eating the presumed carcass of a corps decomposing by the sun. Wash and Go. Text and images from the exhibition Tuga Suave, by Yonamine, 3+1 Arte Contemporânea Gallery, Lisbon, 2008. Born in Luanda in 1975. He lived in Angola, Zaire (now DRC) in Brazil and the United Kingdom. Currently lives and works between Lisbon and Luanda. His artistic education was consolidated mainly during the first Triennial of Luanda, in Angola, through participation in various workshops, conferences and seminars. Participated in several international exhibitions in Brazil, Museum of Modern Art of Bahia and Rio de Janeiro, in the Canary Islands in the Centro Atlântico de Arte Moderna, in Cuba at the 10th Havana Biennial, highlighting the participation in the 52nd Biennial Venice, the African Pavilion, and the 9th edition of the Sharjah Biennial, the United Arab Emirates. Porto, Portugal. Curator and Professor. Master of Sports Medicine and PhD in Sports Science. Professor of Introduction to Contemporary Thought at the University of Porto. He was responsible for the areas of Thought, Science, Literature and Transversal Projects under "Porto 2001 European Capital of Culture". Currently is cultural adviser of the Embassy of Portugal in Rome.